Extra Large 80+ lbs 5 1/3 + 1 cup for each additional 20 lbs. 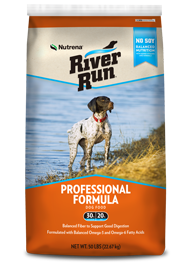 River Run Professional Formula 30-20 Dog Food is formulated to meet the nutritional levels established by the AAFCO Dog Food Nutrient Profiles for All Life Stages except for growth of large size dogs (70lbs. or more as an adult). 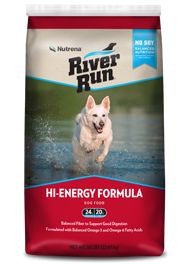 The quantity of River Run Professional Formula 30-20 Dog Food that your dog will eat each day will vary with the breed, size, activity level and environment. 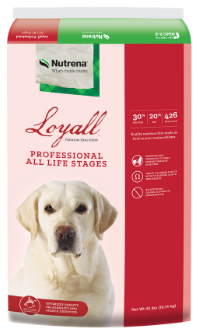 Feed adult dogs once daily or you may choose to use a self-feeder (use dry form only) and make River Run Professional Formula 30-20 Dog Food available to your dog at all times. 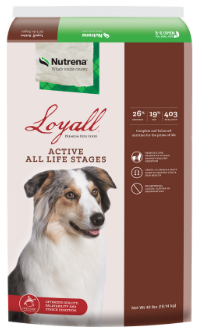 Most dogs will adjust their intake to meet their requirements. Meat and Bone Meal, Whole Ground Corn, Corn Gluten Meal, Animal Fat (with mixed Tocopherols), Brewers Rice, Dried Plain Beet Pulp, Rice Bran, Wheat Middlings, Natural Flavors, Potassium Chloride, Whole Flaxseed, Salt, Vitamins (Vitamin A Supplement, Vitamin D3 Supplement, Vitamin E Supplement, Niacin Supplement, D-Calcium Pantothenate, Riboflavin Supplement, Thiamine Mononitrate, Pyridoxine Hydrochloride, Folic Acid, Menadione Sodium Bisulfite Complex [source of Vitamin K activity], Biotin, Vitamin B12 Supplement), Minerals (Calcium Carbonate, Zinc Sulfate, Ferrous Sulfate, Zinc Amino Acid Complex, Iron Amino Acid Complex, Copper Sulfate, Manganese Sulfate, Manganese Amino Acid Complex, Ethylenediamine Dihydroiodide, Sodium Selenite, Iron Oxide), Propionic Acid (a preservative), Choline Chloride.